LOW PACKAGE RATES. EXCELLENT SERVICE. PAY ON THE SPOT. NO PRE-PAYMENTS, NO CREDIT CARD GUARANTEES REQUIRED ! A fantastic and adventurous round tour on The Queen of all islands: BALI! A varied program filled with action, adventure, nature, culture and lots of fun. Seat in with a group, private or your own individual group with friends. Starting from U$D 699 pp!!!! Few other exotic destinations have as much to offer as Bali does to amaze, impress and bring joy to even the most spoiled and experienced traveler. 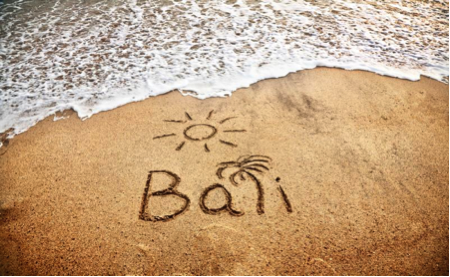 Bali isn’t just a holiday destination exclusively for the somewhat older and high end travelers. Without doubt this island presents itself to youngsters as a perfect destination for an unforgettable holiday. Once arrived at the international airport in South Bali you will be welcomed by the local guide and transferred to the hotel in the cosy city of Ubud. The best way to relax after a long flight is in one of the many artistic little bars and restaurants in this vibrant little city! The transfer takes around one and a half hour. Ubud is without a doubt one of Bali’s most well-known cities. In fact, the region of Ubud consists out of 14 villages, each with their own specialty, such as: woodcarving, painting, sculpting, silver… It is widely considered as the cultural, holy and arts centre of the island. The only thing the city ever absorbed was the cultural heart of the artists who moved here in the 20th century, attracted by the stunning natural beauty and the authentic villages and landscapes. During day it can be a bit crowded, however in the morning and evening it retains its typical and magical charm from back in the days. Ubud has been a popular holiday and residency destination for jetsetters, artists and bohemians since decades. Let’s stretch our legs today, because there is no better way to discover Bali with all your senses then a fun and easygoing bicycle trip through typical villages, beautiful rice paddies and passing the enthusiastic local people. See, feel and smell the island! This trip is made to escape the hustle and bustle of touristic areas and to discover the magic and feel the spirit of rural Bali. First we head to the little village of Kintamani to enjoy a breath-taking view over the Batur Volcano and its crater lake. Next we head to the starting point, pick a mountain bike and let ourselves gently roll downhill for about 24 kilometers via quiet village roads. We have numerous stops on the way, including a visit to a Balinese home/compound (where you get to see firsthand how the Balinese live outside of the tourist areas), a giant Banyan tree, a typical village temple and some rice paddies. The English speaking guide will happily provide more information about the rice production in Indonesia. After this relaxing ride we head to the restaurant for a delicious buffet lunch. Vegetarian lunch can be provided on request. After a sumptuous lunch we head back to the hotel, however, on the way there we stop at a Balinese spice garden to show us the spices and fruits grown here. We also get to sample some local herbal teas and coffees, including Coffee Luwak, the most unusually produced and most expensive coffee in the world. Afterwards we return to the hotel for some free time. *Off-road mountain biking possible with supplement: This all-terrain route is a bit more challenging than the normal cycling trip. We ride for 35 kilometer from the Batur Volcano to Ubud, passing several different types of underground. You will experience bamboo forest, single track though the rice paddy fields, nice fast flowing downhill dirt tracks, jeep tracks, farm trails and broken tarmac roads through the local villages. This day ride is just right, not too hard and not too easy. Comfortable sport shoes and a minimum of experience on a bicycle are necessary. Prepare to get wet! Because after breakfast you will be picked up and transferred to the starting point of today’s activity. There you will get some instructions about how to behave in the boat and you will receive a life jacket, paddle and helmet. 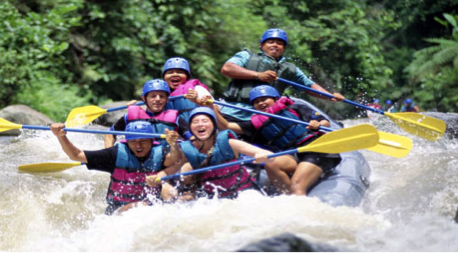 Next we take off for a two-hour long adventure on the holy Ayung River, passing typical villages, beautiful nature, lush green jungle and mighty waterfalls. Maximum up to six people in one boat + guide are allowed. After the rafting you will have a sumptuous lunch included in the price and time to change into dry clothes. Bring with you: dry clothes, shoes or sandals that can get wet and some cash money for a drink at lunch and tipping. Hint: there is a waterproof bag on board the boat. We highly recommend that you do not take your camera on the rafting trip. Better to buy a waterproof disposable camera. Taking a Go Pro is always a possibility, but attaching it is at your own risk. After lunch we get ready for a cultural afternoon. We visit the holy water temple of Tirta Empul in Tampaksiring, where you can take a cleansing bath in one of the public pools. The guide will inform you on how the purification progress should be done, after which you can try it out for yourself. Note: these holy pools should be entered with clothes and sarong! You can use your wet clothes from the rafting for this. Next up we drive to the ancient King Tombs of Gunung Kawi. This 11th-century temple complex is thought to be dedicated to King Anak Wungsu of the Udayana dynasty and his favorite queens. The tombs are situated in a valley, so to reach them we need to descent around 300 unequal stairs. Afterwards we return to the hotel for some free time and relaxation. *For those who want their activity a bit more ‘hands on ‘we can replace (with supplement) the rafting by an adventurous canyoning. In the morning you will be picked up at the hotel for this great day in North Bali. This activity is suited for beginners and everybody with a normal physique. Prepare for a nice mix of swimming, natural water slides, jumps and rappel. In short: two hours of fun and action! Besides the thrill you can also enjoy the wonderful environment this region has to offer. Lunch is provided after the canyoning. Very early wake-up call, because we depart for the starting point of our morning trekking with sleep in our eyes. Mount Batur (Gunung Batur) is 1717 m above sea level. Besides experiencing the awesome beauty of an active volcano, trekking in the cool, early morning darkness obscures the difficulty of the challenging hike (torches, hiking sticks and wet weather gear supplied, if needed). The dark also helps to focus walkers to do the ascent making it feel less difficult. The bonus is arriving in time to witness a glorious sunrise and experience the stunning morning views of the surrounding crater and lake. It can be a bit chilly at first, so make sure you wear something warm. As soon as the sun rises it will start heating up quickly. Breakfast on the top. During the descent we discover the three young craters and the most recent lava streams, while enjoying the amazing volcanic landscape. After this memorable experience we continue our journey via the northern coast of Bali towards the magnificent Bali National Park in West Bali. Here we will stay in the laid-back village of Pemuteran. After breakfast you will be brought to the local harbor of the National Park. We will board a small boat and 30 minutes later we arrive at the famed uninhabited Menjangan Island. Guided by a local Park Ranger we snorkel over the dramatic underwater cliffs (drop-offs) in this marvelous underwater aquarium. We will encounter many colorful fish and other weird creatures. Maybe we even find a family of cute Nemo clown fish or a whole school of feeding mackerel can pass us. Next we board the same boat and move to the pearly white sandy beach across the island. Here we will settle for the night with a view over the mighty volcanoes of Java, sleeping in basic tent. A simple meal will be prepared for the group on a bon fire on the beach. In the meantime you can enjoy the rest of the afternoon and evening on this small piece of heaven deep in the National Park. You can take a stroll to check surroundings searching for wild deer and other animals. No light pollution here, so hopefully we can enjoy thousands of glimmering stars! (Note: no tent overnights during most of the monsoon season. All year: tent overnights are weather permitted, and might be cancelled –even last minute- due to bad weather or dangerous sea. Overnight will happen than in a local hotel or guesthouse.). We wake up with the singing of the birds. While the Park Rangers prepare a healthy breakfast there is some time for swimming and snorkeling off the beach. By boat we leave this peaceful spot and head to the harbor, where we will find our rides for today. We head to the relaxed beach village of Lovina in North Bali. We shortly stop at the Pulaki Monkey Temple, after which we continue along the northern coastline, passing lovely sceneries and typical villages and going uphill towards the village of Munduk. There we will make a short soft trek to reach the waterfall, where you can take a dip in the clear water underneath the waterfall. A refreshing experience! Next we continue to our destination: Lovina Beach. *International driver license is obligatory! Transport by car will be provided for those who prefer not to drive the scooter. No insurance for scooter drivers. Around 6AM you will be expected at the beach, where you will all board some local fishing boats and head out into the Indian Ocean during the sunrise in search of a school of dolphins. Tumbling and playing in freedom with the sunrise on the background, a beautiful image for every animal friend. (There is never a 100% guarantee that you will spot the dolphins..). We head back to the hotel for breakfast. Meanwhile Cabrio VW Classics (with open roof) will await us at the parking to bring us to Candidasa in East Bali. A wonderful ride through a lush green environment. On the way we visit some cultural highlights, such as the peaceful Beji Temple. This beautiful temple - built from pink sandstone and housing some dramatic sculptures – is rarely visited by tourists. Constructed in the 15th century it is dedicated to the rice goddess Dewi Sri, who protects the irrigated rice paddies. Beji is seen as one of the oldest temples in Bali. Next we continue to the impressive Besakih Temple, which is built on the slopes of the holy Mount Agung, and is Bali’s holiest, most important and biggest temple. It is actually a complex of 35 temples and must for every visitor to the Island of the Gods. Wearing a sarong (traditional loin cloth) is obligatory. We continue our road passing lush green natural sceneries as seen from our open roofed classic cars towards the hotel in Candidasa. There you will be able to enjoy some free time to wander around or relax at the pool. Candidasa is a seaside town in eastern Bali that rests on the edge of a fresh water lagoon. It is popular tourist stop and is often described as a more sedate and laid back beach alternative to the teeming, nightclub filled Kuta area or the large, manicured resorts at Nusa Dua. Many restaurants and cozy bars can be found here. Be sure to check out if any live music is being played later that night. Today is all about relaxing in the hotel or you can discover the near vicinity of Candidasa. Free to go and do as you please! Enjoy a relaxing massage in one of the many massage parlors, discover the nearby beach, go snorkeling of just enjoy the hotel facilities. Optional: Those who have always wanted to explore the magical underwater world can opt for a beautiful Intro Dive at the world renowned USAT Liberty Wreck! Under guidance of an experienced dive instructor you will first receive some theoretical explanation, after which some basic skills will be taught in the pool. Next some exercises will be done in open sea followed by a guided tour around the wreck, which over some decades has been covered with beautifully covered coral and houses a multitude of colorful fish and other sea creatures. With a bit of luck you will even spot Jack, the fearless house barracuda! An amazing dive to start your diving career. After breakfast you will be transferred to the nearby harbor of Padang Bai, where will board the fast boat to the tiny island of Gili Trawangen (about two hours). On this small island no motorized vehicles are allowed, however you can easily get to the hotel on foot or by horse cart. Once arrived you are free to enjoy the pearly white beaches, many restaurants and the vibrant night life on this little patch of paradise.There is plenty of possibility to snorkel in these rich and clear waters. The Gili Islands are the place to be to be for spotting sea turtles while snorkeling, being lazy on the beach and for drinking a nice cocktail at one of the many beach bars. Many bars have extended happy hours and special nights to bring the party to you. There is a genuine Irish Pub and of course a Reggae bar with live music, but there are also lounges and mini clubs are all situated in the same street. A last morning to enjoy Gili Trawangan before we take the fast boat back to Bali. Upon arrival we will be transferred to the vibrant beach area of Kuta. Kuta is very popular with youngsters from all over the world. Kuta is the ideal location to let it all loose and to enjoy the sun, beach and sea one last time. But also surfing, countless bars, the night life, many restaurants and plenty of shopping possibilities! Time off. OPTIONAL: we can offer countless activities. For example: Through supplement we can provide professional surfing classes during the next days. Kuta Beach is perfect for learning how to ride the waves like a pro! Free days to spend in Kuta by yourself. Treasure everything Kuta has to offer and enjoy the last days in Bali. In the morning we enjoy some more free time. In the late afternoon all of us head to the hip and trendy Double Six Beach. Here you can spend your last Rupiahs on delicious tropical drinks and tapas, whilst enjoying the sunset. Seated in a beanbag , dreamy lounge music playing on the background… The perfect setting for a last night out and talking about the trip you have experienced these last two weeks. Those who are in for it can dance the night away one last time in Kuta or Legian. Sadly this wonderful trip is nearing its end and the time to return home is drawing closer. Hopefully all of you will fly back with tons of beautiful memories and even some new friends. We wish you a pleasant flight back home and will welcome you back with open arms if you decide to explore some of the other islands of this marvelous archipelago in the future! Every first Friday of the month: 10% discount on the package !!!! Only U$D 699,-pp ! (No discount on the High Season and other Supplements). Note Peak Season: compulsory N/Y dinners will apply, depending of the hotel. No check-outs allowed around new year, depending of the hotel. This package is not recommended for minus 18yro. Note: only available for private groups & tours. Simple...For our standard round tours you pay us when you arrive at Bali... We do not need your credit card details. The accommodation is in 2* and 3* hotels/guesthouses. DBL or TWIN bedding. Extra bed or mattress on request (if available). Always with private bathroom. Breakfast included. Due of Nyepi (Balinese New Year) any arrival or departure in Bali is not allowed, nor by road, sea or air, after sunset the day before and before sunrise the day after. Unofficial date for Nyepi in 2017 is scheduled for 28 March. Date has to be reconfirmed. Activities are guided by specialized local English speaking guides. No guidance during the boat trip to / from Gili Trawangan and on free days. 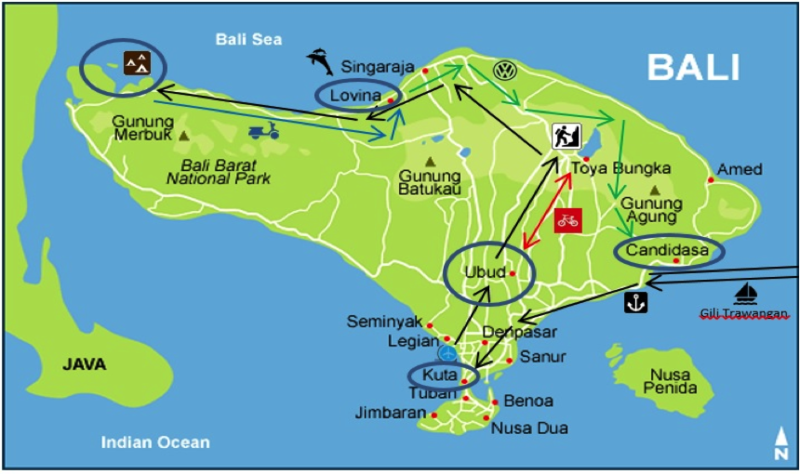 During July/Aug/Sept: it might be hard to book rooms on Gili Trawangan, and the stay might be replaced to Gili Air. 1.1. All personal expenses, like: meals, drinks, souvenirs, extra entrance fees etc. 1.2. All what is not mentioned in the itinerary and under stipulation: ‘included’, Tipping and gratuities for: guides, drivers, driver assistance, bell boys, room maids, waiters... Tipping is never included in the price proposal. Tipping in Indonesia is normal and expected. The average daily amount for tipping depends of the itinerary. For round tours this will be an average 10 to 15 U$D per day (for the driver, guide, sightseeing guides, bellboys, etc). For Beach Stays this will be an average of 2 to 5 U$D per day (housekeeping, etc). It is strongly advised to inform the guests about tipping. Due to unforeseen circumstances and not known circumstances on Oct 01, 2016, all given rates may become invalid and recalculated, like fe. official rise in petrol costs, increase of sightseeing entrance fees, eo. However any confirmed rates upon booking request will remain valid from 6 weeks before departure, except for airline fares which remain subject to change at any given day, and until payment have been received by us. The agent will respect the given and agreed itinerary, but will not take any responsibility regarding unknown closure of sightseeing objects, not available roads or access, or force majeur situations. Bookings made falls automatically under our terms & conditions and we automatically understand you agree with them, even if you did not read them from your side. http://www.indonesiaholidaysdmc.com/our-terms-and-condition.html Upon acceptance of our offer you are accepting our terms and conditions. International passports should have an expiry date of at least 6 months after the return date. OTHER GENERAL CONDITIONS & TERMS MAY APPLY. It should be understood by the guests that in Indonesia, particularly in Sumatra and Java, that the combination of distances in kms and duration is very relative. A rather considered short distance in kms might take much more hours on the road than guests have imagined. Fe. for the routing Yogyakarta or Solo, to Bromo or Malang / from Bromo or Malang to Kalibaru or Ijen / from Kalibaru or Ijen to South Bali might take 12 hrs. It should be understood by the guests that during overland tours, particularly in Sumatra and Java, the departure time for the day program might be early, Depending of the program or routing ahead, but generally at 7am, sometimes between 5 and 6am. In general the logistic is planned to have an arrival in the hotel before sunset, generally 6pm, however no guarantees are given as it might depend of local circumstances. If domestic flight bookings are included; we prior to make the bookings with Garuda Indonesia Airlines, and in some cases with Air Asia Indonesia. We might propose other Indonesian domestic airlines, due to routing or scheduling reasons. Note that all Indonesian Airline carriers, with exception of Garuda Airlines and Air Asia, are blacklisted by the EU. This means; none of this blacklisted airlines are allowed to fly within the EU airspace, and safety warnings and concerns have been distributed regarding those airlines. All our guides / tour leaders are Indonesian. All our foreign language (English, Dutch, French, German, ...) speaking guides are officially certified to guide in the language. However, the foreign language is not their native mother tongue, and might not be 100% fluently or accent free. Flexibility and cooperation from the guests is required. We keep the right, with or without prior notice and without any refund or compensation, to replace a 'certain language' (fe. Dutch, French, German,) promised guide to replace with another 'English' speaking guide. This due the limited availability of foreign language speaking guides during some periods, and the promised 'certain language' guide might fall sick or might not operate due to other reasons, while no replacement is available. If guests are booked through us on a ferry boat or fast boat transfer; if the boats are not going out or operate with delays without a reasonable prior information to us, due of various reasons like fe. ; created by nature, like; bad weather, stormy weather, high seas (act of God), or closed harbor, strikes, or whatever other reason; we will assist the guests with alternatives if there are alternatives. However if any additional costs arise those will be charged to the guests on the spot. Local ferry boats are what they are, and we have no choice to chose a certain operator. Fast boats; we chose operators with a good record and reputation. However; we only act as a middleman for bookings and payments, but we do disclaim any responsibility regarding delays, non operating, bad service, accidents, and whatsoever. Fast Boat transfers from / to Bali > Gili Islands / Lombok; are not advised for children below 5yrs, pregnant women, people with back problems, people with pre-existing health problem, people elder than 64yrs, and those people are automatically disclaimed from any responsibility and insurance coverage by the fast boat operator. Hotel transfers at Bali are based on SIC transport. 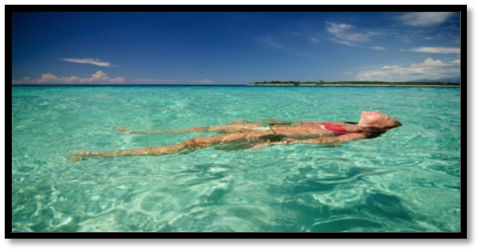 The boat transfers might include several stops enroute at other destinations before arriving at the booked destination. Tipping is never included in the price proposal. Tipping in Indonesia is normal and expected. The average daily amount for tipping depends of the itinerary. For round tours this will be an average 10 to 15 euros per day (for the driver, guide, sightseeing guides, bellboys, etc). For Beach Stays this will be an average of 2 to 5 euros per day (housekeeping, etc). It is strongly advised to inform the guests about tipping. It might happen that a proposed and booked hotel turns out to be below the expectations from the guests. If clients require on the spot to move to another hotel, this is possible based on the following conditions; most hotels will ask a cancellation fee, whether from one to four nights depending of the hotel's policy. The cancellation fee will be charged directly to the clients. If the alternative hotel turns out to be more expensive than the original booked one, the difference in room rate per night will be charged directly to the clients. If the alternative hotel turns out to be less expensive than the original booked one, there will be no reimbursement. For each change of hotel on the spot, a handling fee of US$ 20,- will be charged either directly to the clients, or upon agreement directly to their travel agent. It should be understood that if a 'sunrise' or 'sunset' is included in the proposal, we can never guarantee the quality, and might mostly be of a good quality during the dry seasons. It should be understood that overnights in a tent or on a boat are very basic. Usually a mattress is provided, and (sometimes) limited fresh water is available for shower and sanitary. Overall the sanitary facilities, if available, are simple and basic. Indonesia maintain extremely though and active rules and laws when it comes to narcotics including the considered soft drugs, with an absolute zero tolerance, and with heavy penalties, even dead penalties. For recreational users of certain narcotics, it is strongly advised to check before departure of their country all trouser pockets, luggage suitcases, backpacks, etc, if there is no forgotten 'item' left somewhere. Users of prescribed drugs or medications are advised to bring with them a doctor recommendation in English and the original copy of the purchase ticket. Be informed that March 28, 2017 is 'Nyepi day' (Balinese Newyear) in Bali. No movements are allowed from 27 March at noon till 29 March at noon, and guests are not allowed to leave the hotel premises, and not all facilities in the hotel might be operative. Be informed that on June 25 and 26, 2017 it are 'Idul Fitri' (end of Ramadhan) celebrations in Indonesia. During the period of mid-June till mid-July there will be extreme traffic on roadways, flights, ferries, trains, etc., which may cause big delays and unpleasant and discomfort situations for clients traveling especially in Java and Sumatra. Due to limited guides available during the festive period, early bookings are recommended. A valid passport with an expiry date of minimum 6 months 'after' the return date is necessary.